By the mid-19th century, most of the Indian subcontinent was controlled by the British East India Company. In 1858, the region was officially named the British Raj. The colony comprised the territory of the present-day India, Pakistan and Bangladesh. 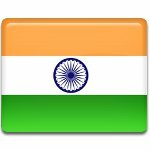 In the early 20th century, Indian nationalist movements began to emerge. The resistance grew stronger and more consistent over time. After the Second World War, the United Kingdom realized that it did not have enough resources for continuing to control India. In August 1947, the Parliament of the UK divided the British Raj into two independent dominions, India and Pakistan. The Indian Independence Act 1947 came into force on August 15, and India became a sovereign state.